According to a message board post on the Internet Movie Database, Dolores O’Riordan was recently spotted in London. Dolores was reportedly seen on King’s Road in the Chelsea district of London, looking “like she rules the world,” according to one observer. No word yet on what she might be doing in London. Although her solo record was slated to be released in spring, there has been no news from Dolores since December, which means that yet another delay is almost inevitable. Update: A source close to Dolores has confirmed to Zombieguide that she was indeed in London approximately three weeks ago. 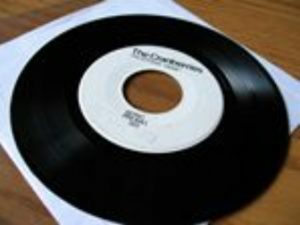 A 7″ record that appeared on eBay weeks ago purporting to be a demo version of “Uncertain” has turned out to be fake. 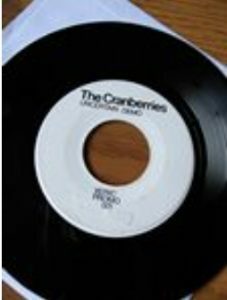 We at Zombieguide purchased the vinyl, only to be dismayed that not only was it not The Cranberries, but that it wasn’t even a Xeric Records release. The vinyl is actually a 1989 punk release on Glut Records, catalog number FRIDGE 001. The vinyl carries four songs by Glut artists, none of which even remotely resemble The Cranberries. A close inspection of the center label shows that the actual label information (“Glut Records”) has been whited out. The actual catalog number, “FRIDGE 001,” is etched into the inner ring of the vinyl. “We never released a 7″ version of Uncertain, or a demo. There were demos, but we would not have released them. 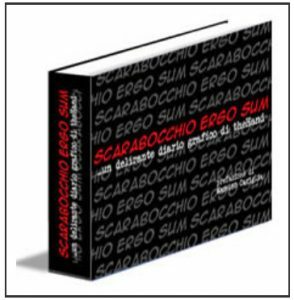 The EP is the only version of that track, there was the white label and the printed cover version. I have most of everything we ever released, and that is what I have here,” he said. In 2002, Fergal Lawler sent Zombieguide a copy of a demo version of “Uncertain,” which appears to have been taped from a radio broadcast. We have an MP3 of that demo available to download (see first link in post, “Xeric Records Demos” folder). 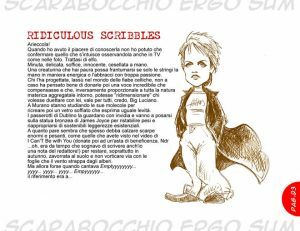 The Cranberries’ “Uncertain,” released in 1991 on Limerick label Xeric Records, is only available in three known formats: a CD release (discography), 12″ vinyl (discography), and a 12″ white-label test/promo vinyl (discography). The CD version is the version most sought-after by collectors, usually fetching over $100. The fake vinyl has since been “lost” in the mail. We returned it for a refund, only to have the seller claim that he never received it. Why did this vinyl get re-labeled as a non-existant Cranberries rarity? It’s a question we still have yet to answer. The seller claims to know nothing about it, and has an otherwise good eBay feedback rating. Universal Music Distribution this month pulled the US single release of “When You’re Gone” (discography entry) from its catalogs, making the single now officially out of print. 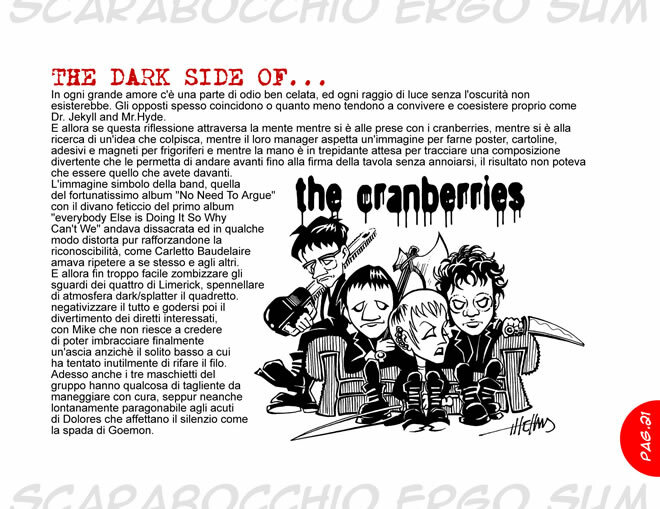 In 2002, Universal similarly removed the original pressings of The Cranberries’ first four albums from its catalogs, instead replacing them with expanded “Complete Sessions” versions with all of the studio B-sides from that era. Italian cartoonist theHand (aka Maurizio di Bona) is gearing up to release his first graphic diary, titled Scarabocchio Ergo Sum, which includes several pages of Cranberries and Dolores O’Riordan caricatures in its pages. The book compiles work that theHand has completed over the last three years. 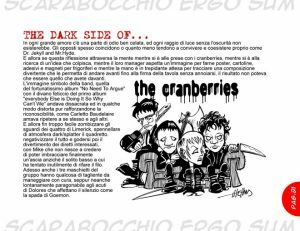 theHand produced a line of official merchandise for The Cranberries in 2003. 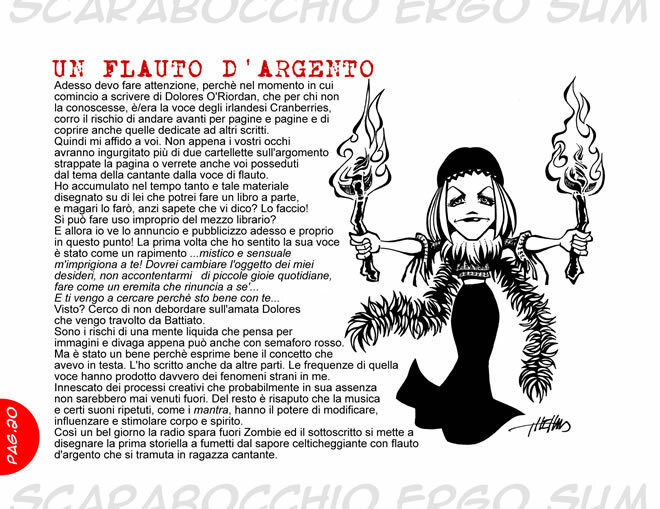 One piece included in the book, a spooky horror-flick rendition of the now iconic No Need to Argue album cover, was part of that line of merchandise. Thanks to theHand for the preview images.